Click here for information about Peter's personal collection of books on the subject of papermaking now held at the University of Iowa. The Ergonomics of Hand Papermaking or How to Make Paper Without Getting a Sore Back (2000) by Peter Thomas. This 20 minute DVD gives suggestions for how to set up a studio and make paper in ways that will help avoid back problems and repetive motion injuries. Suggested warm-up exercises are described. The DVD includes footage filmed in traditional western paper mills in England and Sweeden that illustrate the traditional techniques used to form and couch paper. 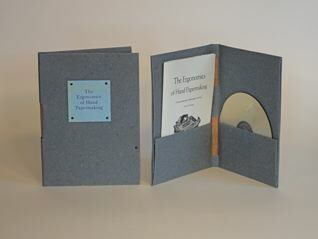 Handmade paper cover with 12 page pamphlet and DVD in pockets. $75. Most papermakers who see this say, "if I had only seen this before I hurt my back...."